It’s too hard to predict which ones will be any good. Daniel Carlson was taken by the Vikings in the fifth round in the 2018 draft. He’s no longer on the team. One of the strongest takeaways of the early NFL season is that the Minnesota Vikings need to stop drafting kickers. Last Sunday, rookie Daniel Carlson endured one of the worst days for a kicker in recent history, becoming just the 15th man this century to attempt at least three field goals without hitting any of them, according to Pro-Football-Reference.com. Carlson was drafted in the fifth round, one round higher than the Vikings selected Blair Walsh in 2012. Walsh is also a distinguished member of the 3+ missed kick club, pulling the feat for the Vikings in his rookie year. For good measure, he did it again last year on the Seahawks. Like Walsh, Carlson is also currently looking for an NFL job. The Vikings cut him Monday after his last-second, overtime miss of a 35-yard chip shot, which left the Vikings in a 29-29 tie with their archrival Packers in Green Bay. Minnesota replaced him with free agent and longtime Cowboy Dan Bailey, who is only the second most accurate field goal kicker in NFL history. Drafting Carlson in the fifth round doesn’t sound like a huge investment by the Vikings, given that most fifth-round picks in general don’t amount to much.1 But a fifth-round pick for a kicker is more like a first-rounder for any other position. Since 2000, just 16 kickers have been taken in the fifth round or higher, led by Sebastian Janikowski, taken 17th overall in 2000. (Janikowski is another kicker on the misery list of shanking all three attempts in a game.) In the same time period, 53 quarterbacks and 75 wide receivers have been taken in the first round. Carlson is hardly the first drafted kicker to struggle so much that he ends up booted out of the NFL. Last year, second-round pick Roberto Aguayo was released by Tampa Bay and has yet to attempt another regular-season kick. He missed nine of 31 attempts as a rookie. So is there any reason for a team to draft a kicker — especially one so high? We looked at all field goals since 2000, using data from Pro-Football-Reference.com. In total, 140 kickers made 13,469 made field goals on 16,389 total attempts, for an 82.2 percent success rate. Limiting our sample to the 91 kickers who had at least 15 attempts2 gave us 13,328 field goals on 16,175 attempts. But then we broke it down further, looking at kickers who were drafted out of college versus kickers who were signed as free agents. Ultimately, there was no improvement in field goal accuracy for drafted kickers relative to the proverbial man off the street. Carlson isn’t the only drafted kicker to get the hook this season. The Browns released 2017 seventh-round pick Zane Gonzalez after he missed two field goals against the Saints, including the potential game-tying kick in the closing seconds, and two extra points. In typical Browns fashion, it turns out that he may have been kicking with an injury unbeknownst to the team and head coach Hue Jackson. Either way, the team signed rookie free agent Greg Joseph to kick Thursday against the Jets — and he made two field goals and an extra point, with no misses. The kicking game in general has been an ugly mess this season. Through two weeks, NFL kickers had made “only” 80.7 percent of their field goals, which would be the lowest rate for a season since 2003. Even last year’s AFC Pro Bowl kicker, Pittsburgh Steeler Chris Boswell, has followed up his 35-for-38 season by missing both of his attempts plus an extra point already this year. It’s hard to view this season as anything more than an aberration, though. Success has been steadily increasing over the years, as noted in 2016 by FiveThirtyEight’s Benjamin Morris, and that trend continued in the following two seasons. Even 80 percent is a massive improvement from 1986, when barely two-thirds of kicks split the uprights. But while kickers are generally getting better, having one that ends up being bad seems random. So we have come here not to criticize NFL GMs in their kicker-picking ability, but to pity them. 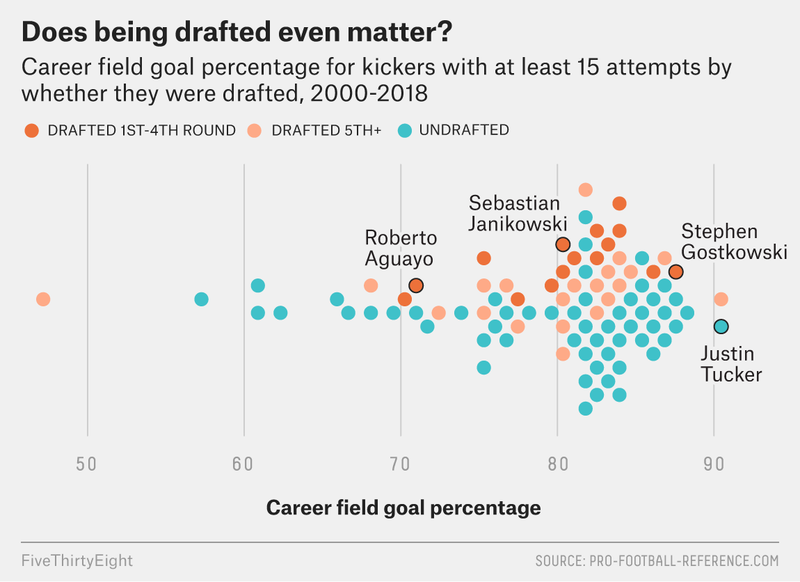 Not only is predicting whether a kicker is going to make a specific kick virtually impossible, past performance in kicking — whether in college or in the NFL — also doesn’t seem to predict future results. So regardless of Bailey’s career excellence, the Vikings can’t be that confident that he’ll make his next kick any more than they would have been if they had kept Carlson. The 40 fifth-rounders of 2017 have a combined two touchdown passes with seven picks, 522 rushing yards, 124 catches and nine sacks. Janikowski’s abundance of long attempts are skewing his success rate, though — he has an 86.1 percent rate on field goals under 50 yards, which is slightly better than the 2000-2018 league average of 85.3 percent for that distance.